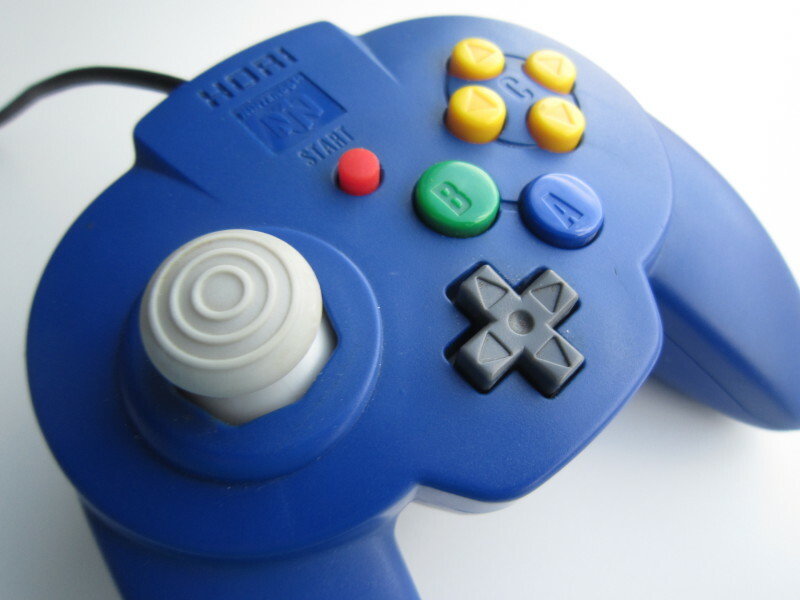 Nintendo 64 and Gamecube controllers are excellent controllers which are quite appropriate for many PC games, and of course are perfect for emulators!. 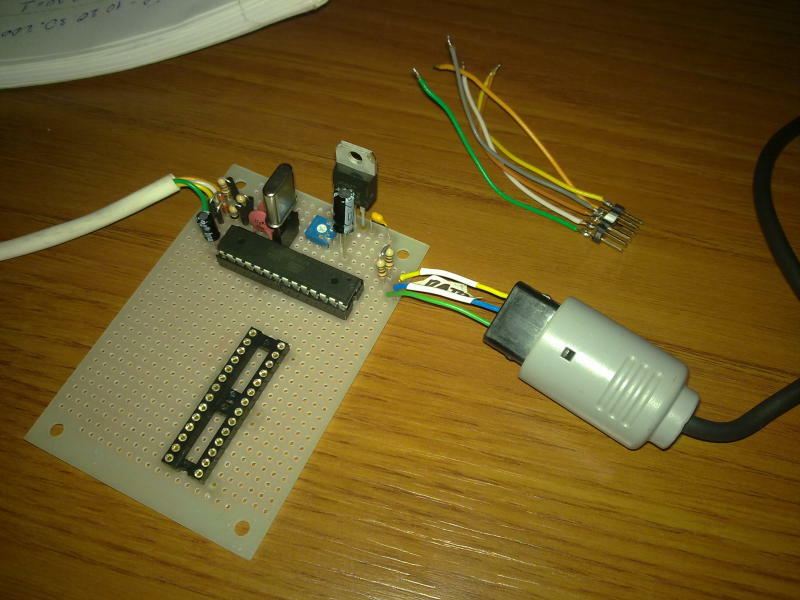 The microcontroller firmware in this projet implements a standard HID joystick which means that no special device driver is required. It works perfectly well under Linux and Windows. Supports Wireless controllers (Known to work at least with the Nintendo Wavebird (since firmware version 1.2) and an Intec wireless controller). NOT SUPPORTED YET: N64 Memory cards. 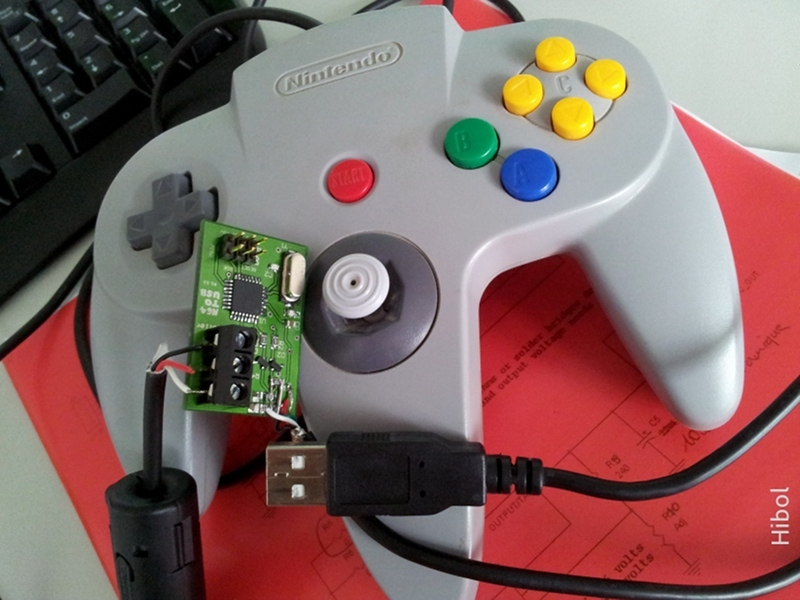 One of my friends wanted to play Nintendo 64 games on his PC using an original controller... so I developped an adapter for doing this. 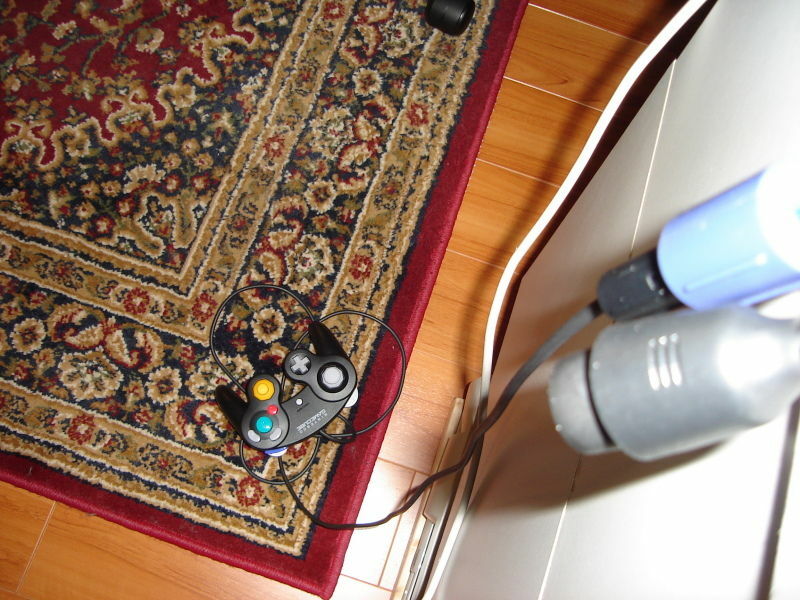 But since Gamecube controllers use a very similar protocol, it was easy to support Gamecube controllers too. 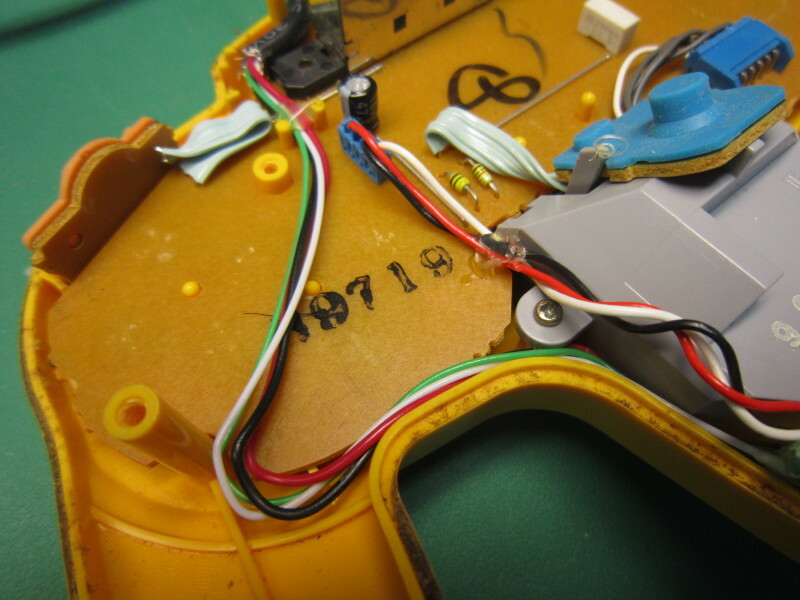 Gamecube and Nintendo 64 controllers both work at 3.3 volts. But on the USB bus, only 5 volts are available. 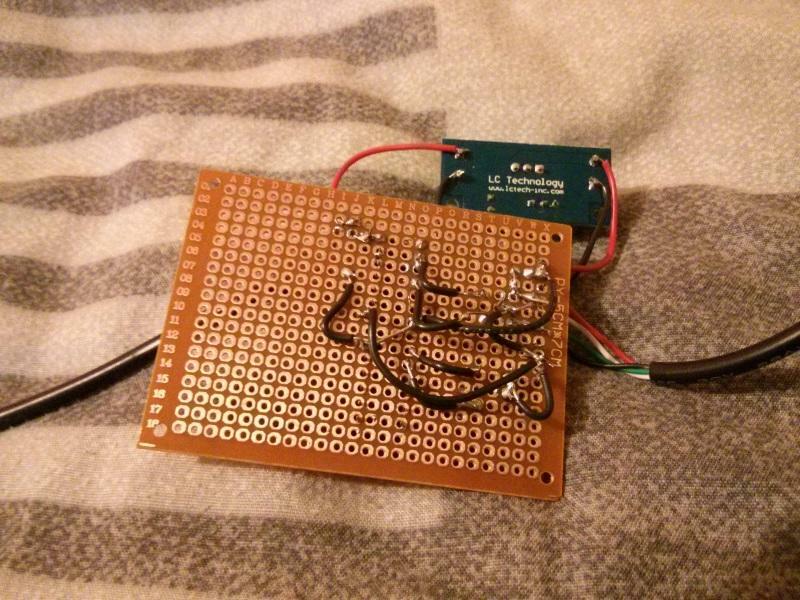 For this reason, a voltage regulator is required. 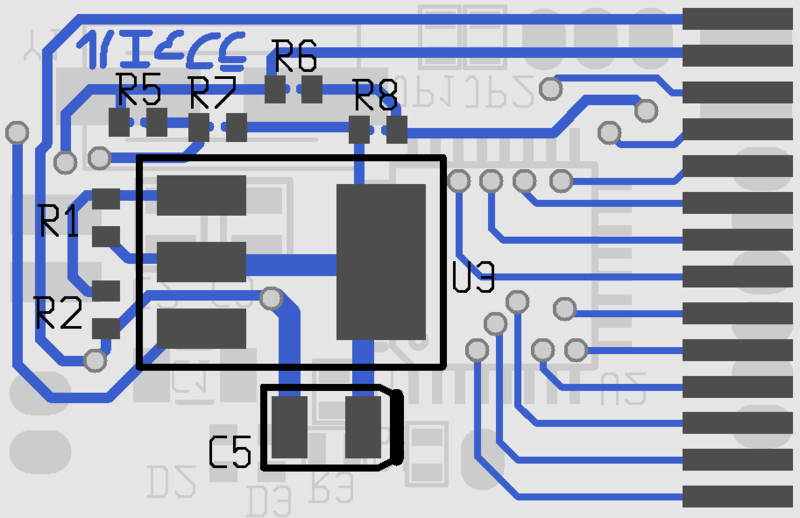 Apart from the different firmware, this is the only difference (and additional complexity) this project has with my Nes/Snes controller to USB project. 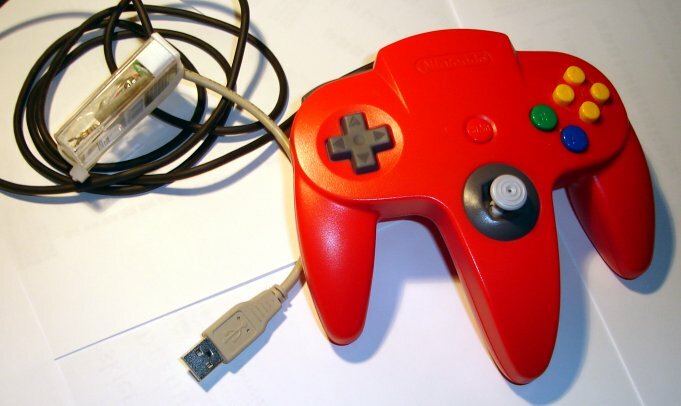 An example of permanently converting a N64 controller to USB. 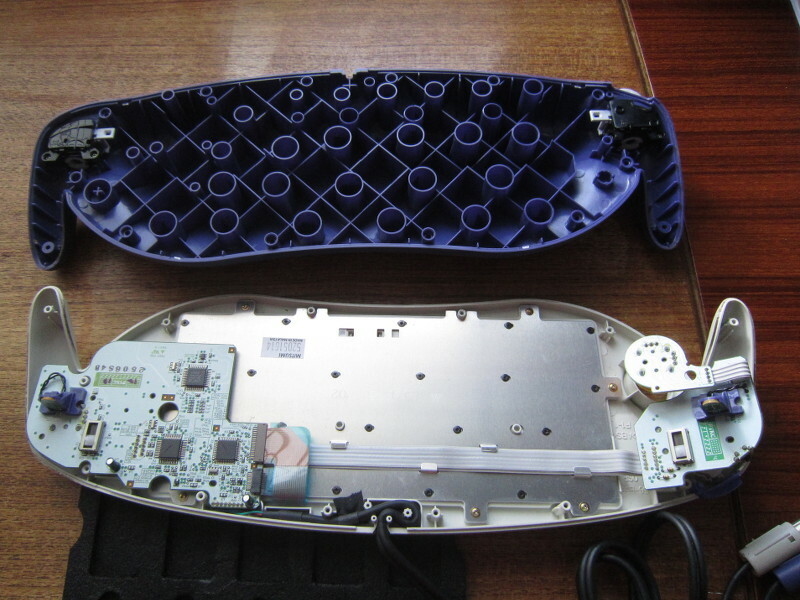 There is not much space inside, but by removing a small amount of plastic, the circuit fits well in the controller's middle "finger". 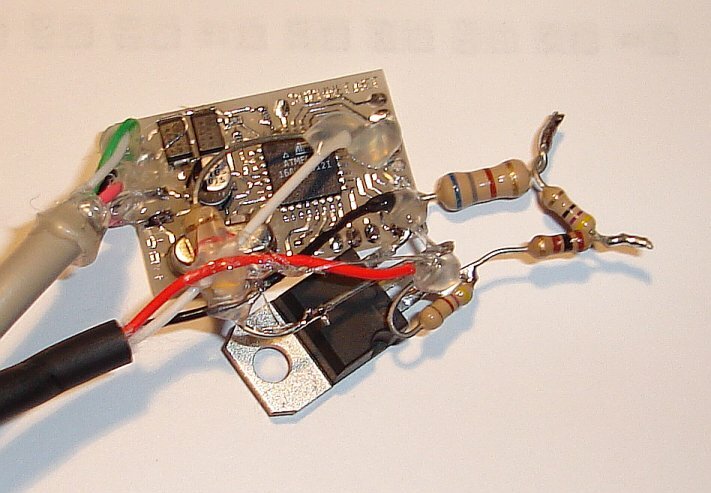 The layout of the wires must be carefully planned in order not to interfere with the cover. I used hot glue to hold them in place. 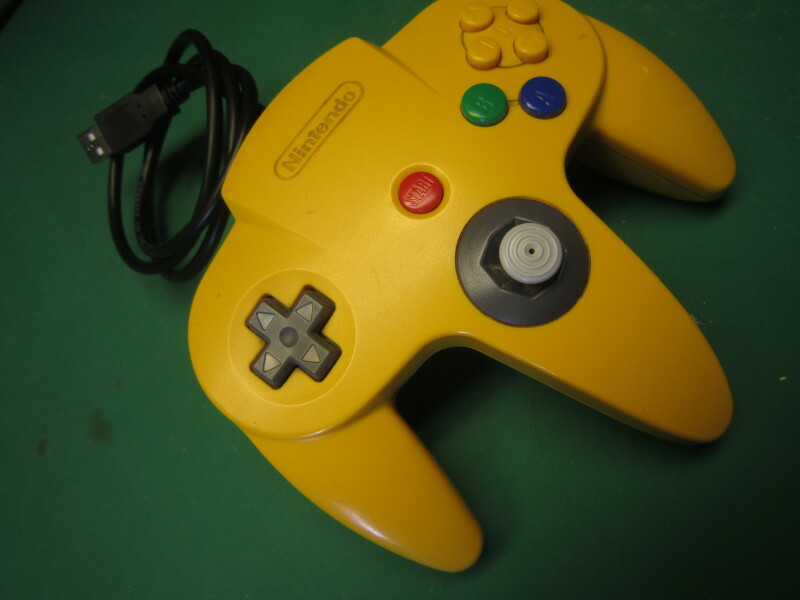 The N64 Hori-mini and white Gamecube controller with extra long cable work! 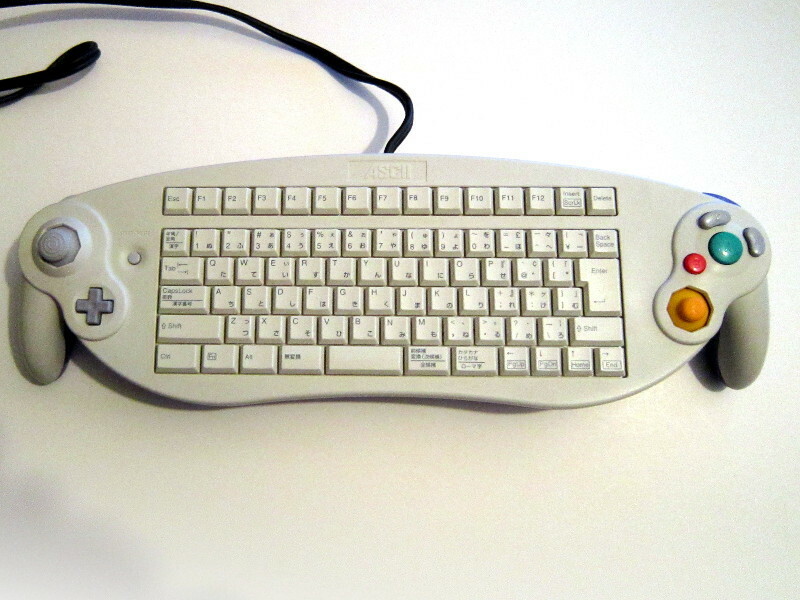 The Gamecube keyboard is supported since version 2.9. Note: The bliss 4pack displayed here is NOT a 4 player version of the project. 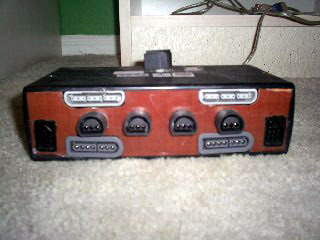 It is only an USB HUB with 4 built-in GC/N64 to USB converters. 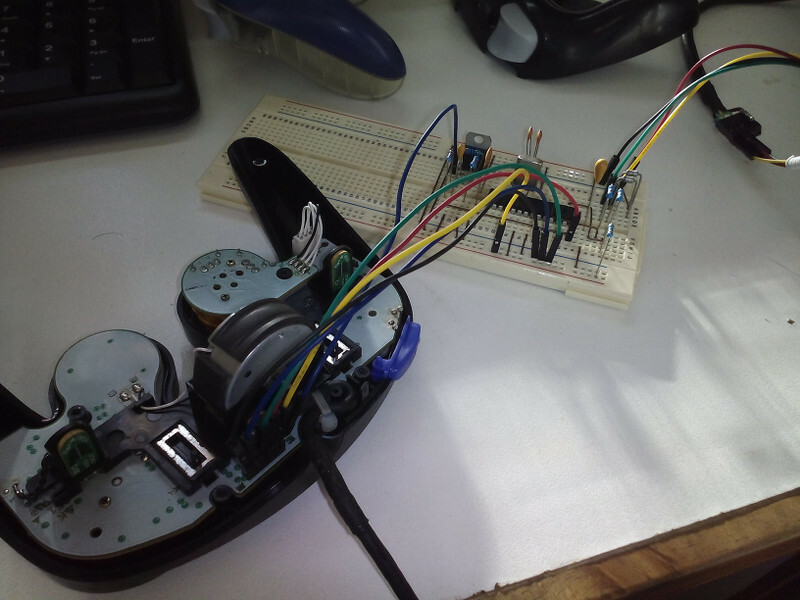 2013-02-14: Ludivine built a N64 adapter based on this project. 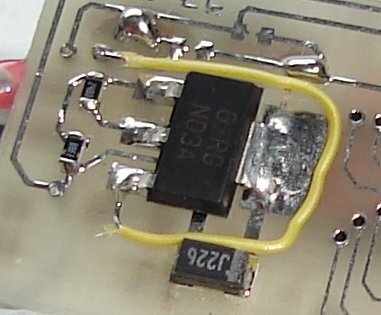 The voltage regulator is on the back side of the PCB. 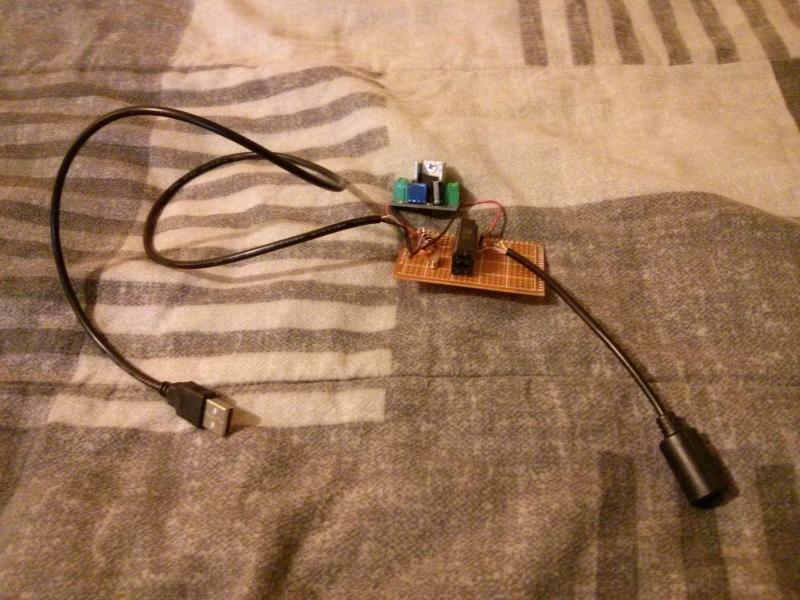 TALENTO from Bulgaria sent me pictures of the GC/N64 to USB adapter he built on universal board. 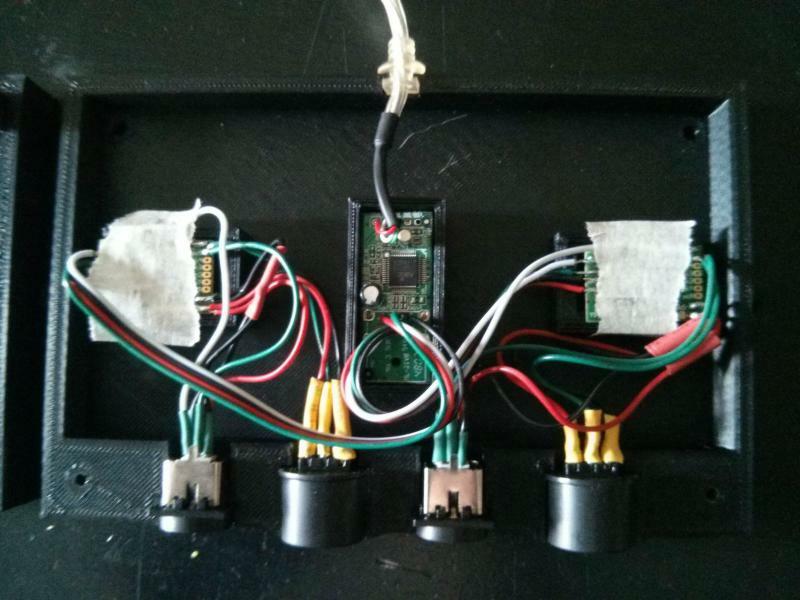 Browner87 used a 3D printer to build an enclosure housing a pair of GC/N64 to USB circuits, four controller connectors and an USB Hub. Additional comments and pictures available on imgur. 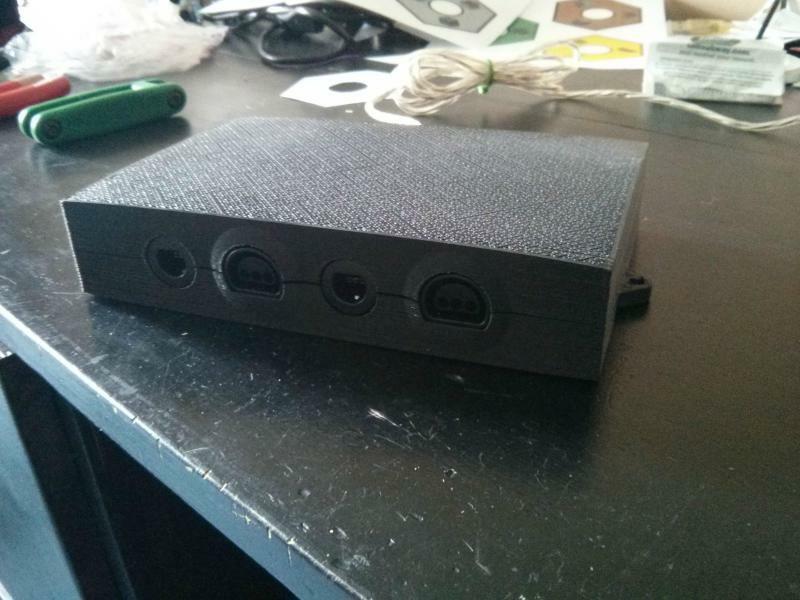 Jonathan sent me the following pictures of the Gamecube to USB adapter he built. 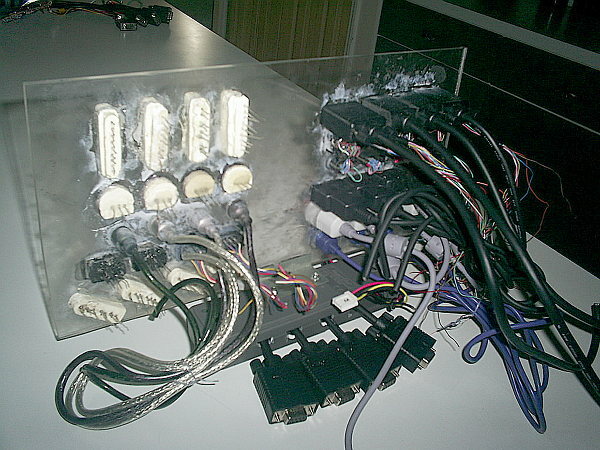 He used an Atmega8L-8PU which is therefore overclocked. But it seems to work fine for him. 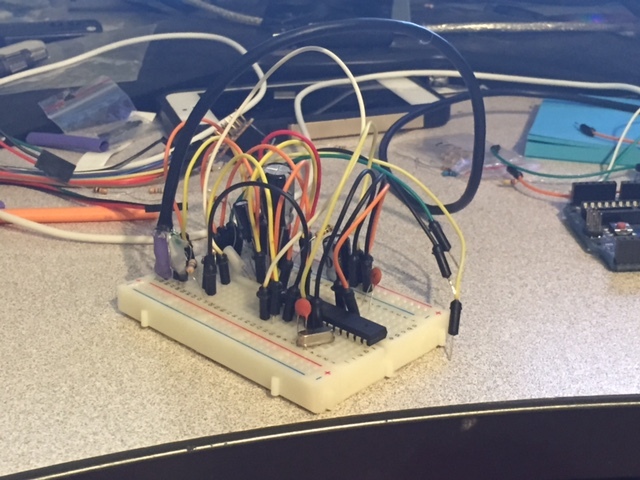 Rickey sent me a picture of the adapter he build on a breadboard. 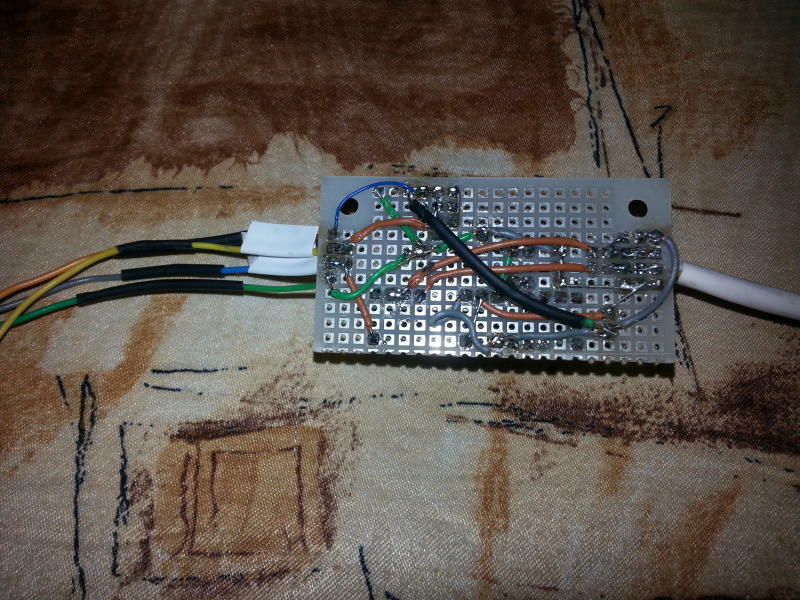 He used an ATMega328P programmed with the Atmega168 firmware and fuses and everything works! 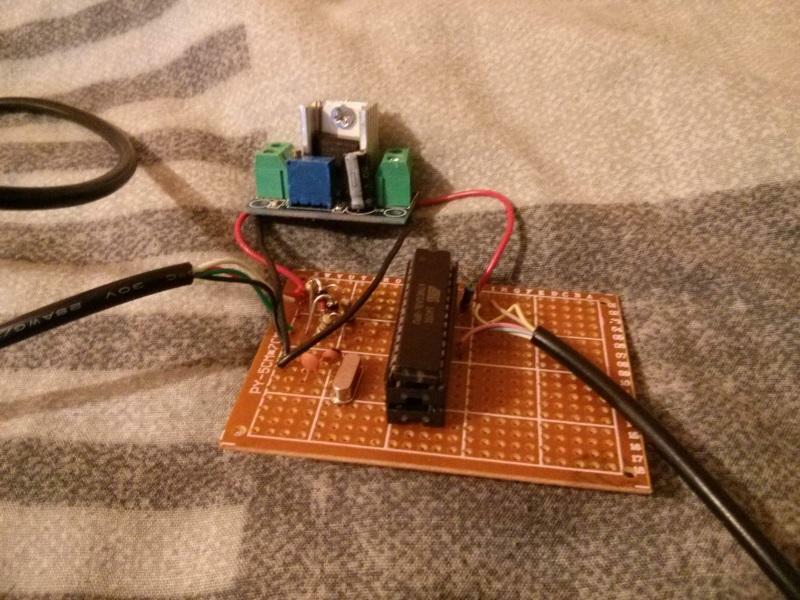 Ashley form Queensland, Australia, is helping his little brother Shaun (who's 14) with a few projects to get him interested in something other than just playing games. 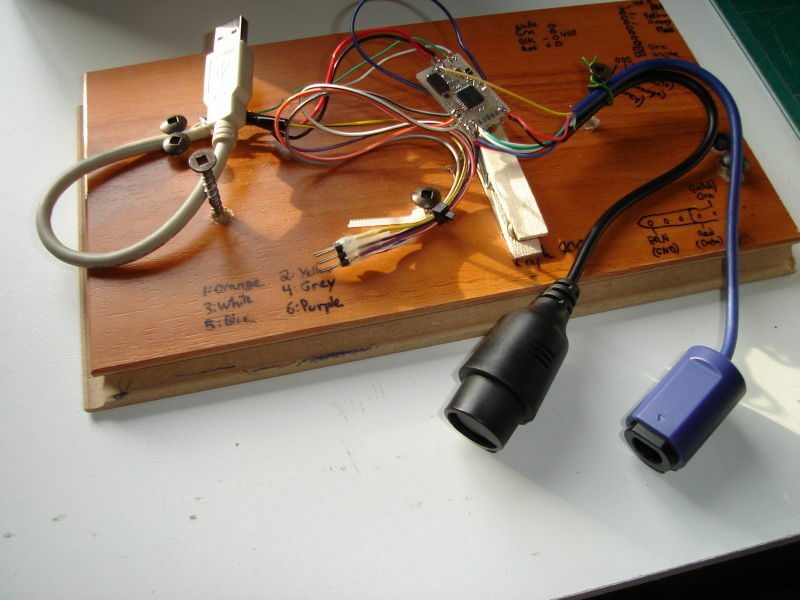 Together they built the SNES/NES to USB and Gamecube/N64 to USB circuit on a single breadboard. 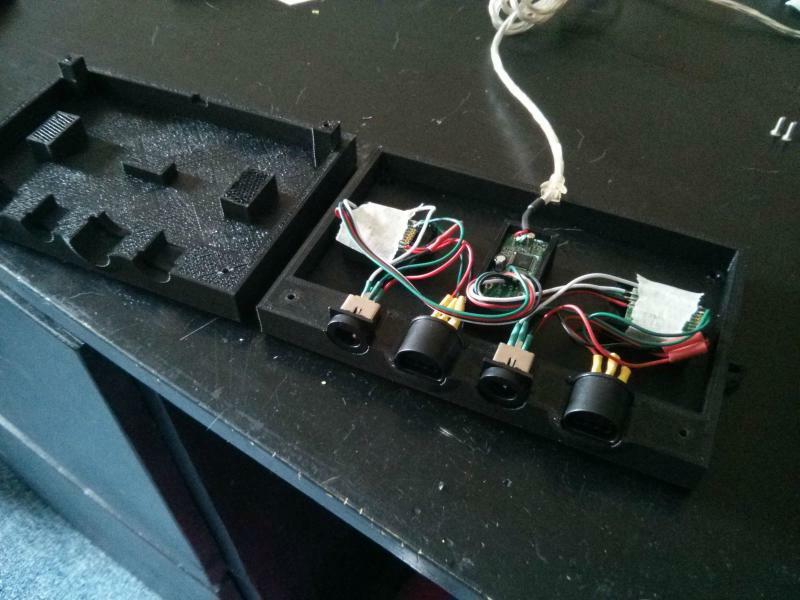 Components are on their way for the final version. 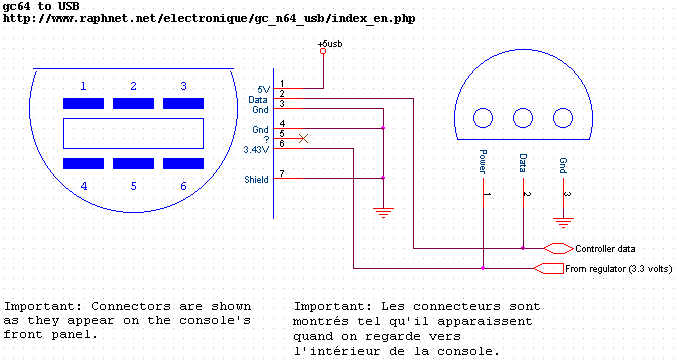 Comments: Some webpages mention that the Gamecube controllers work at 3.43 volts, some other pages says it's any voltage between 3.3 and 3.8! volts... I read an old message in the comp.emulators.game-consoles news group where the author said that the Nintendo 64 supplies 5 volts to the controllers (Wrong!). 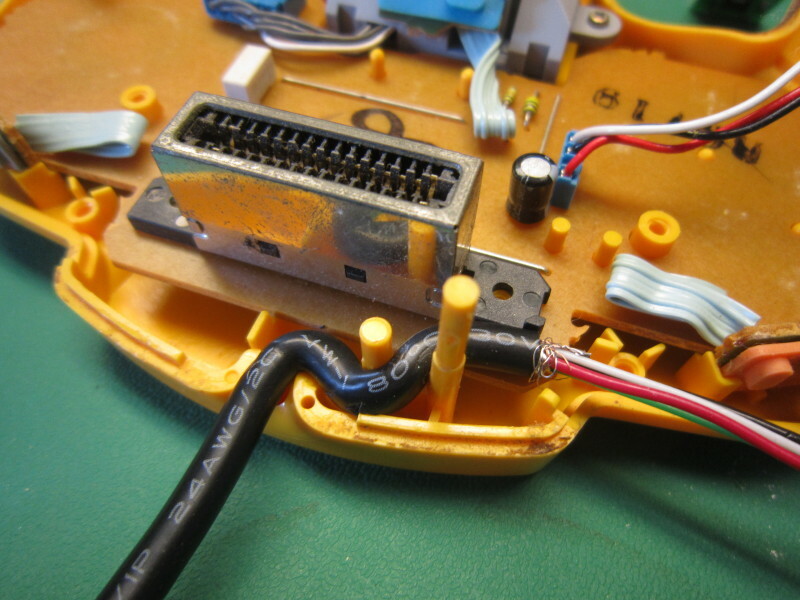 I measured 3.36 volts on my N64 so personally, I choose to supply 3.3 volts to my Gamecube and N64 controllers. In order to obtain 3.3 volts, you can use a fixed voltage regulator such as the 78M33C or an adjustable voltage regulator such as the lm317 or lm1117 (exemple). 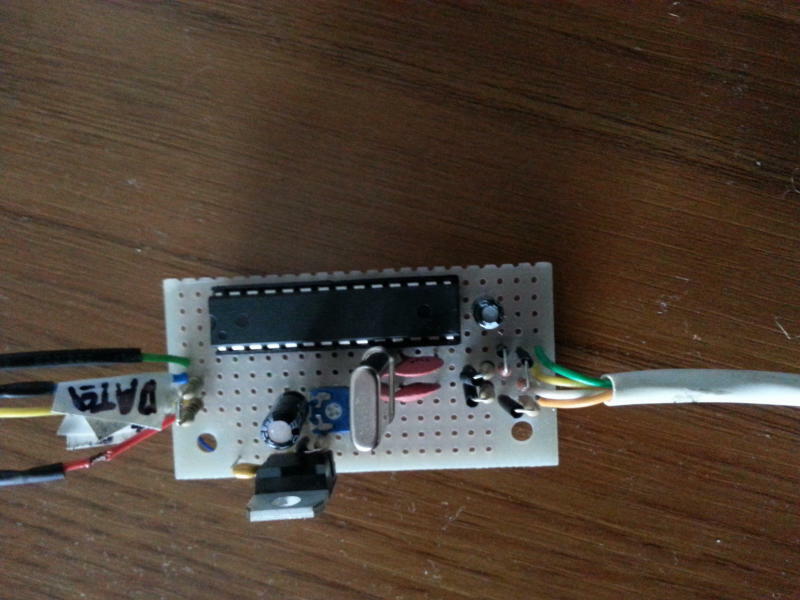 If you use an lm317 variable voltage regulator, here's a simple tool which can help you find a good value for R1. Any voltage between 3.26 and 3.40 volts should do the job. 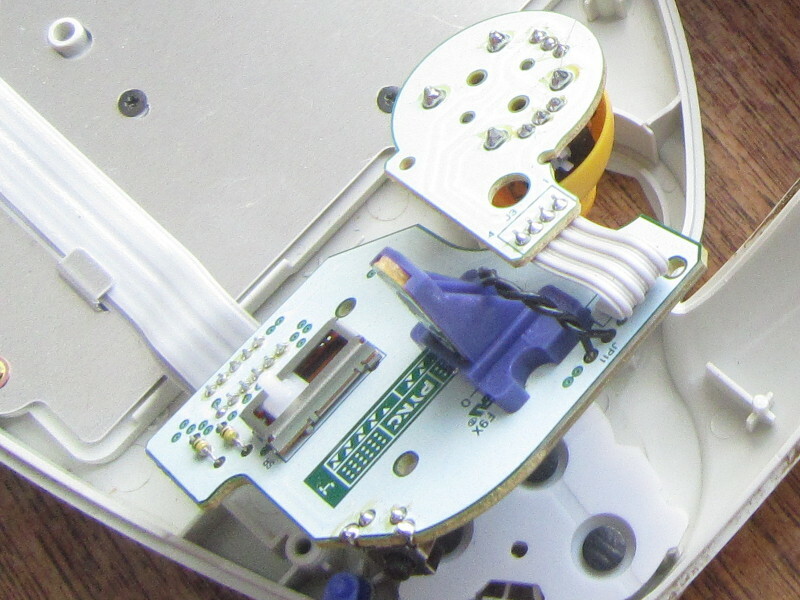 Keep in mind that wire colors varies between manufactures, and sometimes between revisions of the same product. Blindly following color codes without any checks can be a good way to ruin electronics. 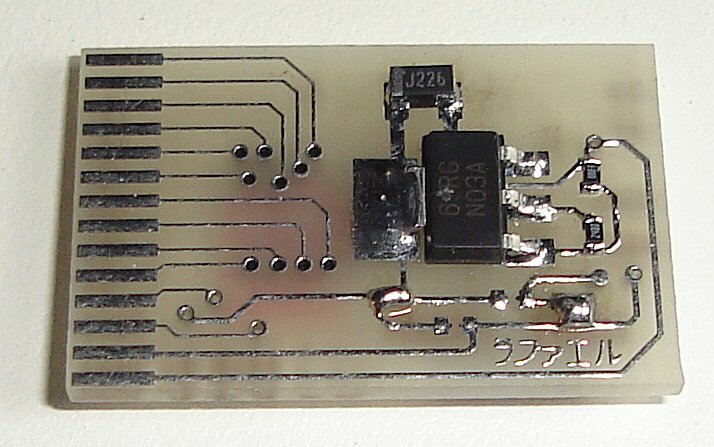 Due to the fact that this board is two-sided and has numerous vias, building it at home may be a little harder than the ususal. If you want, you can get professional PCBs from my online store. The PCBs from my store, however, are a little older than the one above. 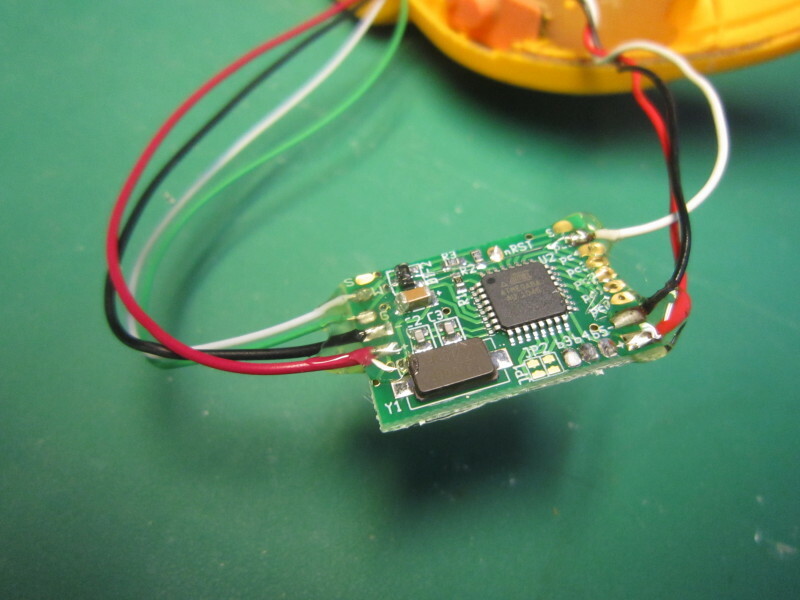 I've had a huge quantity produced with a small mistake: The 5 volts supply from the USB bus does not reach the regulator! Prevent 8bit overflow from occuring. Helps some cheap 3rd party controllers that have the Left not working problem. Fix non-working timeout when waiting for the controller. 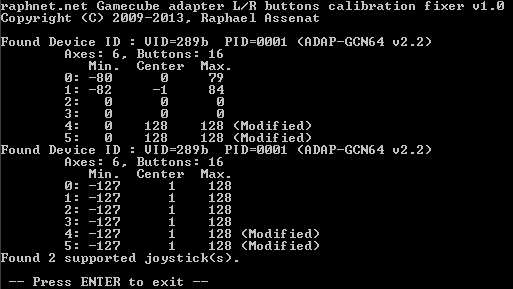 The adapter now enumerate without controllers as it used to. Add support for the Gamecube ASCII keyboard. Rework for device/report descriptor switching. Used to switch from Joystick to Keyboard mode. 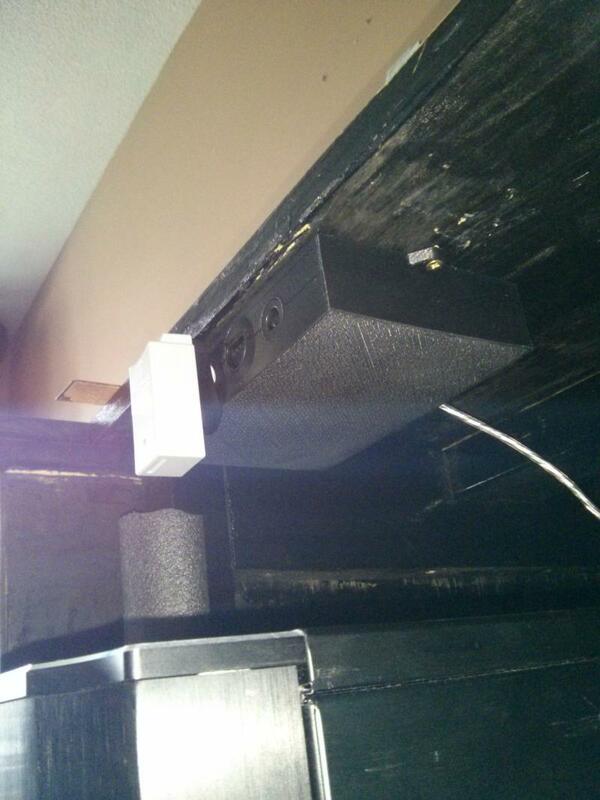 Improved N64 rumble pack detection. Fix compilation with newer compilers. Calibration fixer updated to support this new firmware. The calibration fixer source code is now included. Serial number now working again. 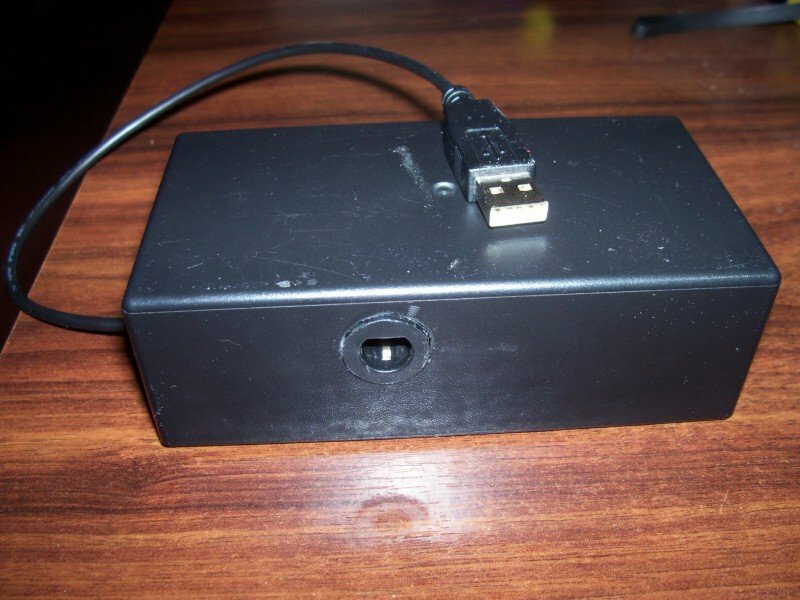 Use a new USB Vendor ID. 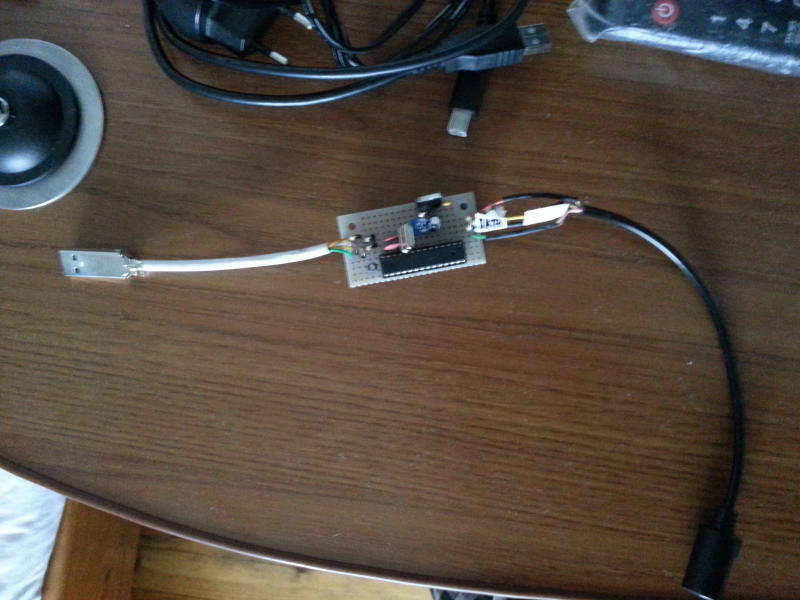 Fixed USB detection when no controllers are present. This was broken in version 2.0. Controller swapping still worked fine though. Changed the device name to allow easier version identification. 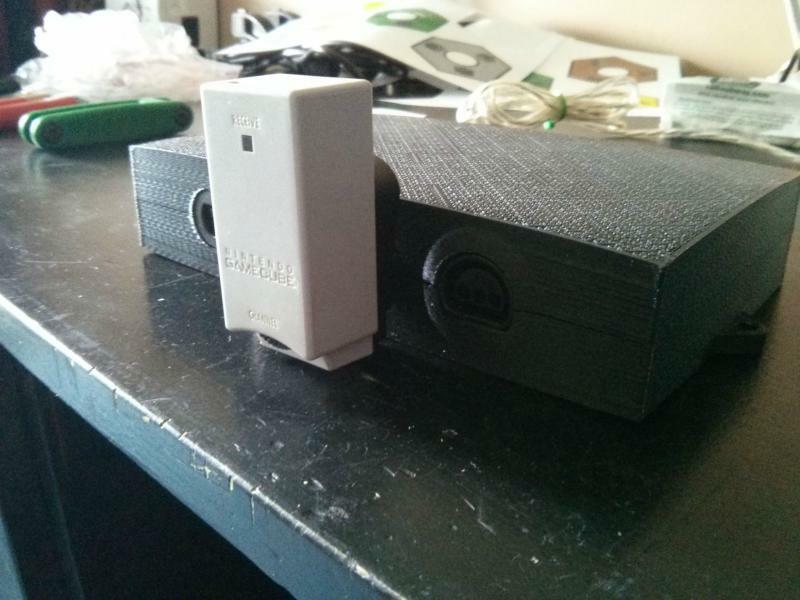 N64 rumble pack and Gamecube controller built-in vibration supported! 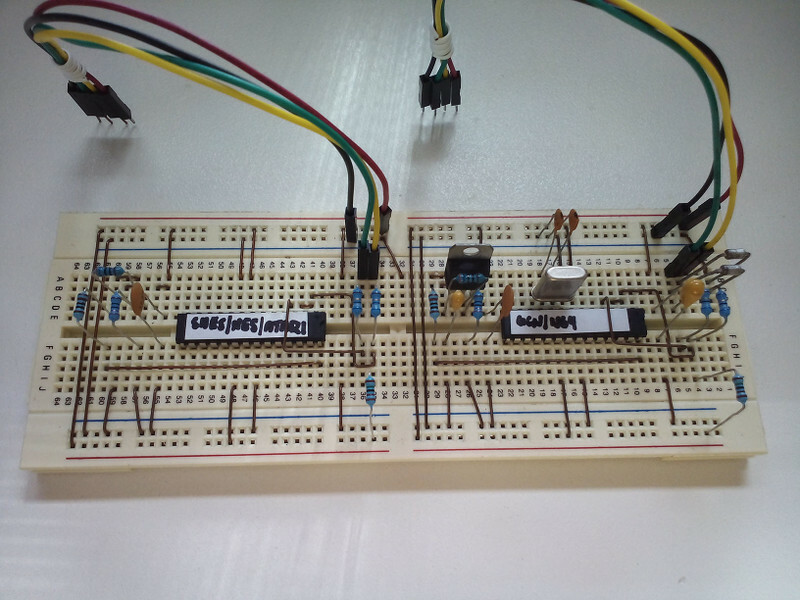 Implemented using standard HID PID (Physical Interface Device) which means: No special driver required. Tested on Linux (fftest) and win7 (Project64/DirectX). Special thanks to Sean Green for providing an updated device descriptor and an example main.c from his own project for me to use and finally implement this feature. Without this, I don't think I would have ever taken the time to add this feature. The L and R buttons analog feature on gamecube controllers can be disabled. Useful when they are causing problems and you don't mind using only the L and R digital switches. To disable the analog feature, fully press L and R when connecting the controller. The calibration fixer windows executables are now provided with the source code. See calibration_fixer/readme.txt for details. New asm transmission code capable of sending many bytes with perfect timing. 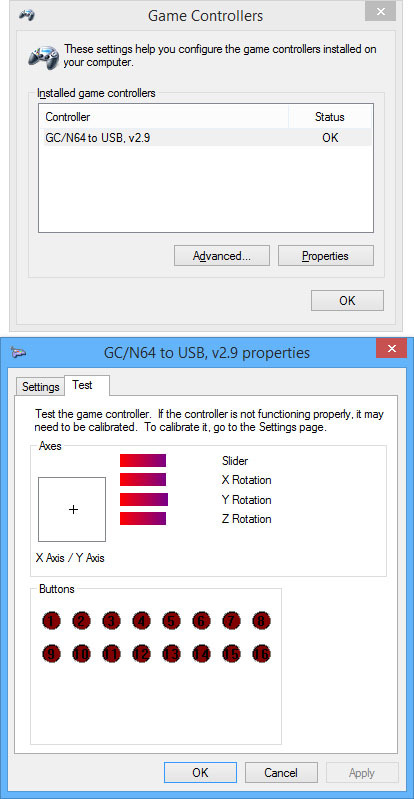 N64/Gamecube communication code is now shared between the N64 and GC drivers. It's the same wire protocol so it makes sense. Update gamecube reception code using the new N64 algorithm from 1.3. To my knowledge, this does not fix a known problem but being more robust should be good. 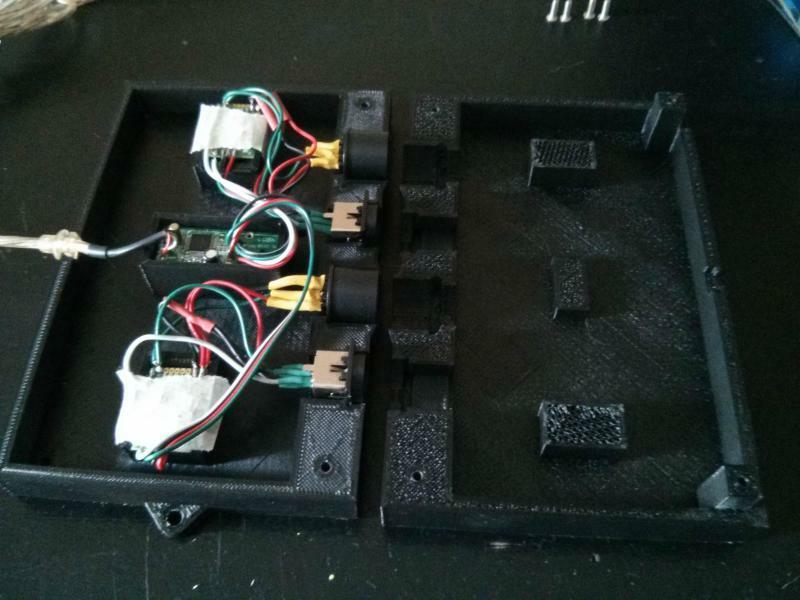 Synchronized controller polling with USB polling. 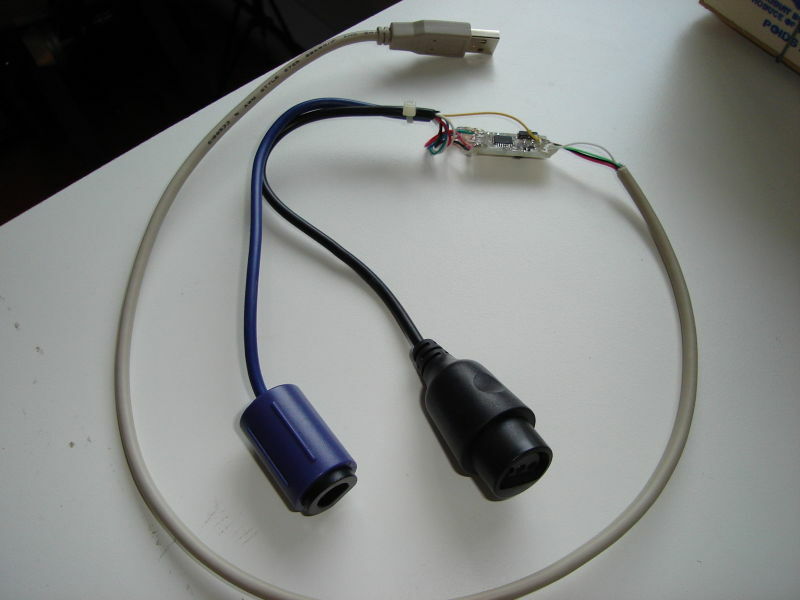 This should prevent USB communications from interferring with the timing sensitive N64/Gamecube protocol. At least with my equipment, this seems to fix very rare spurious button presses (One in several minutes). Confirmed the adapter works with the new white gamecube controllers with extra long cable (Japanese import). 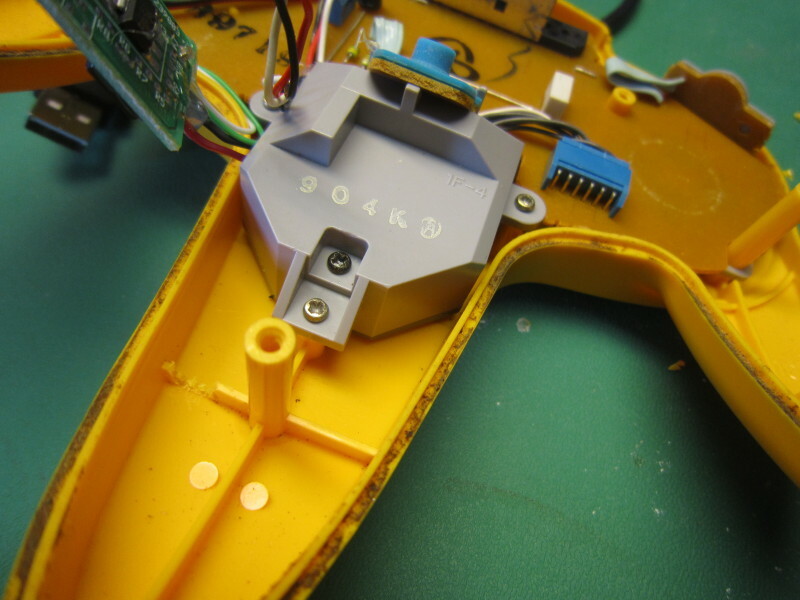 More reliable support for N64 Hori-mini pads.Found out why some HORI pads were having issues (random joystick jumps and spurious button presses). This is due to the HORI communication timing being very different from original Nintento pads. (1.5 times slower bit rate). Implemented a new reception algorithm that should be very tolerant to timing variations and jitter. Works well with all my controllers. 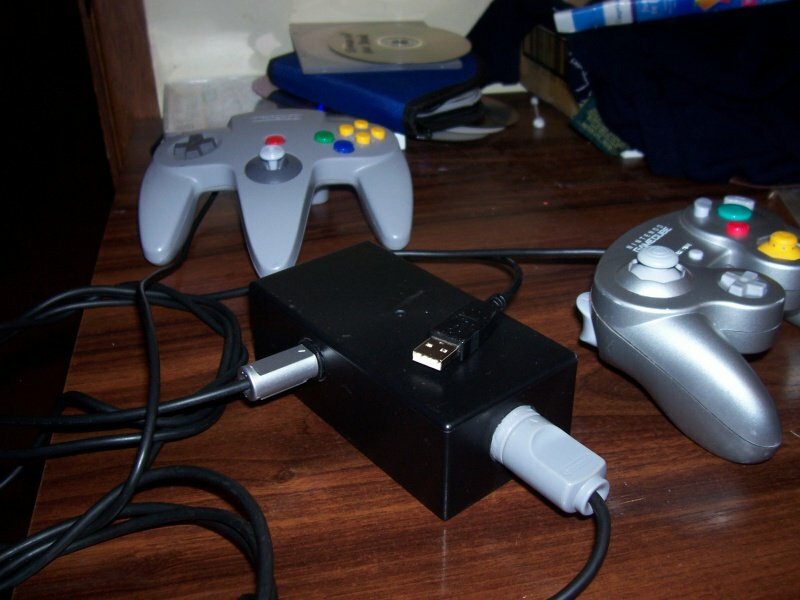 It is now possible hot-swap between N64 and Gamecube controllers. 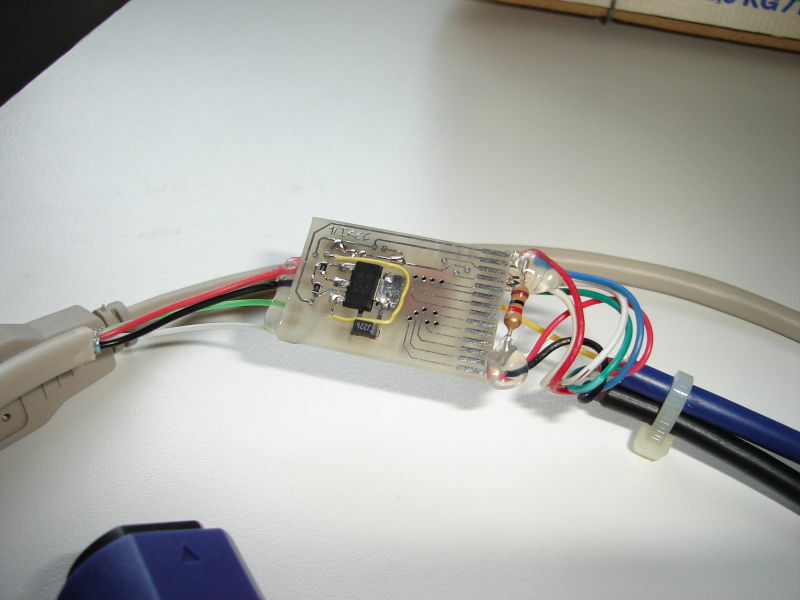 With earlier versions, this would have required a disconnect/reconnect of the USB cable to reset the firmware. 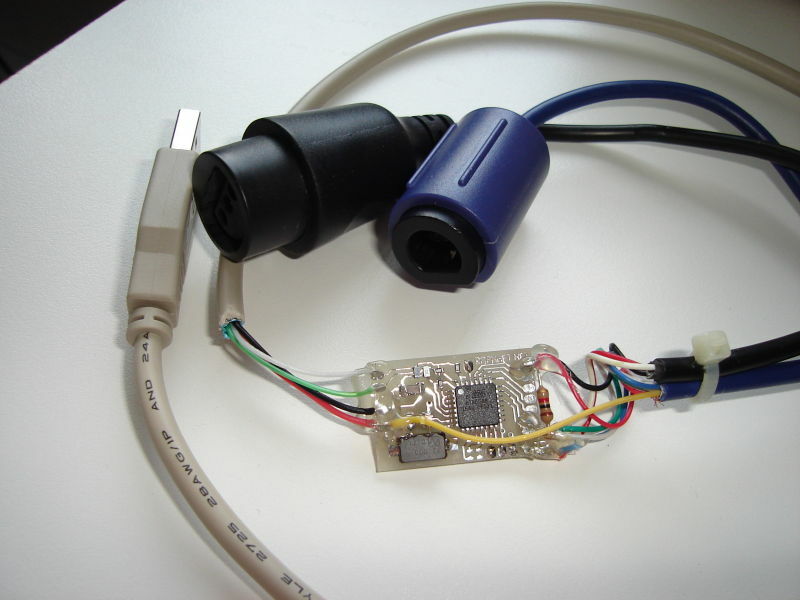 It is no longer necessary to connect a controller (gc or N64) in order for the adapter to be detected by the computer (USB). The source code is available under the GPLv2 license. See License.txt for more information. 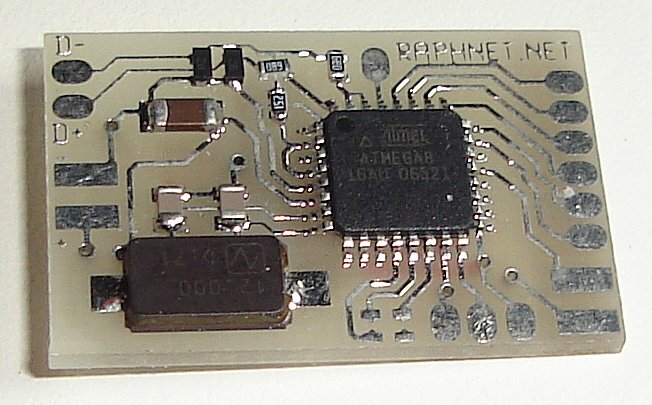 The project compiles with avr-gcc. For Atmega168: HFUSE = 0xD5, LFUSE = 0xD7, EFUSE = 0x01. 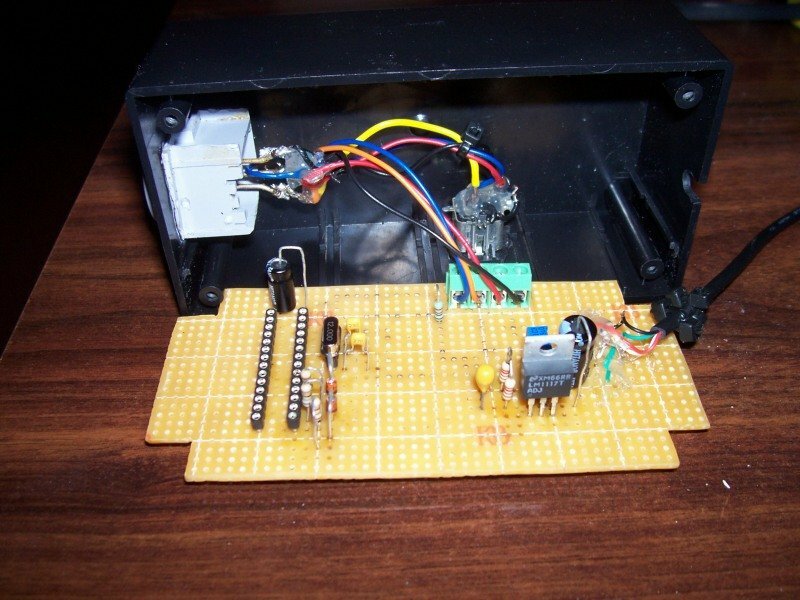 For details about how to program an AVR, please visit my AVR programming page. Since firmware version 1.3, all Hori-mini N64 pads are expected to work correctly thanks to a new algorithm which is tolerant to timing. A technical explaination of the issue and solution is given below. 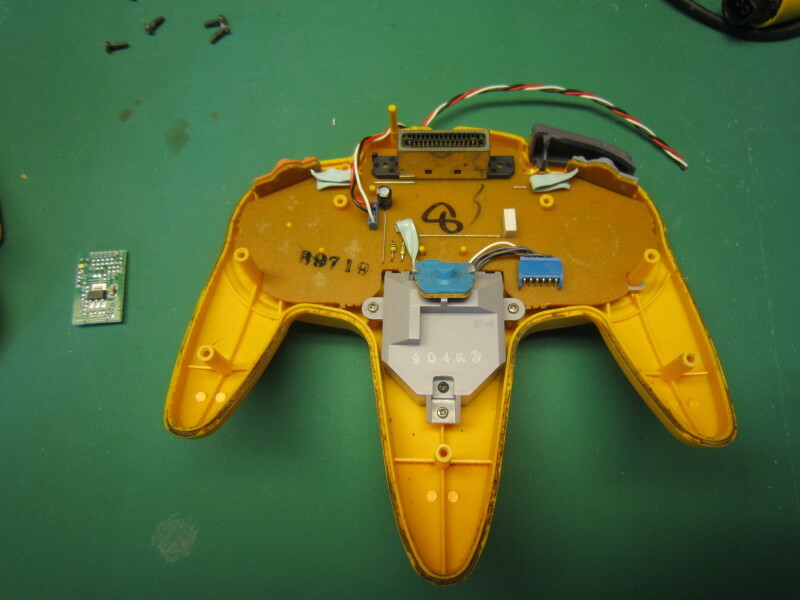 Hori-mini N64 pads are known to misbehave with many adaptors. After testing a donated Hori-mini N64 pad with one of my adapters, they seemed to work properly... Until someone reported problems. When moving the axis, there would be sudden jumps to other positions, hindering gameplay. I tried my Hori controller with a few of my adapters and on a few computers. 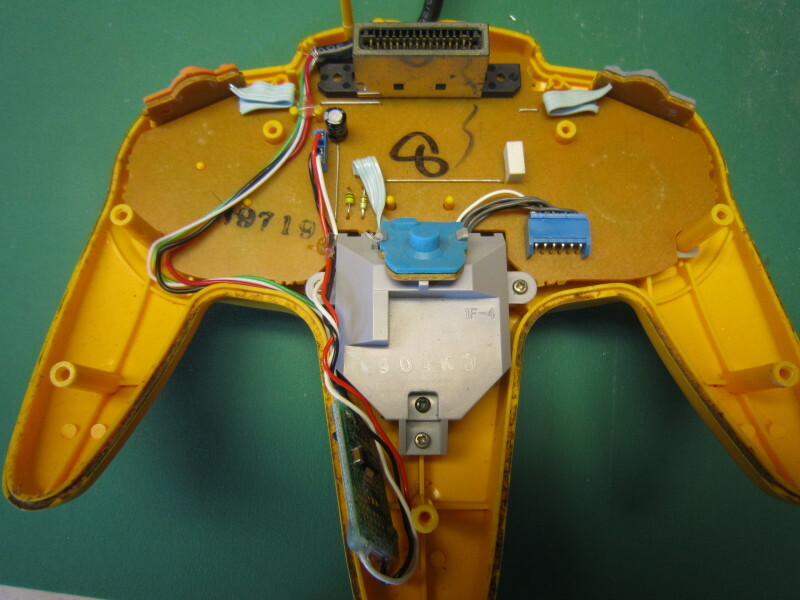 I eventually managed to find a unit which did not work well with my controller and began looking for the cause. As you may already know, the bits are encoded as follows. Normally (at least with Nintendo's hardware), the timing is 3μs low/1μS high or 1μS low/3μS high for transmitting a 0 or 1 respectively. (See references for more information). My original code simply waits for the initial falling edge and takes a sample 2μS later. 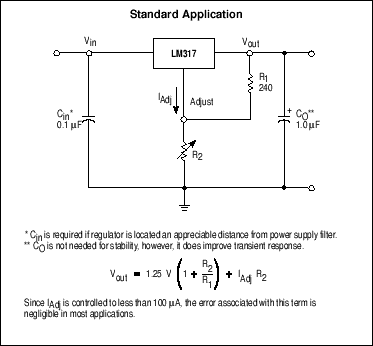 Under ideal conditions, the sample value (1 or 0) is representative of the bit being sent. The 2μS delay means the sample is taked perfectly in the center of the bit. This is nice but only works if the controller uses the normal 1μS/3μS timing (or something close enough). 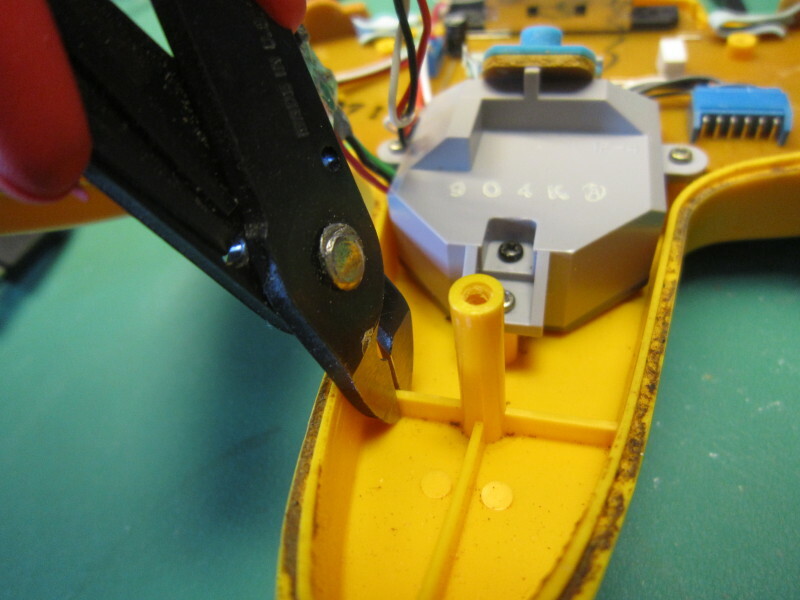 As we can see on the right, the sample position when receiving bits from a Hori-mini PAD is near the rising edge. And it works. But this is bad because in this situation, a small timing difference may cause malfunction ; there are not enough tolerances. And real life has proven this to be a problem. 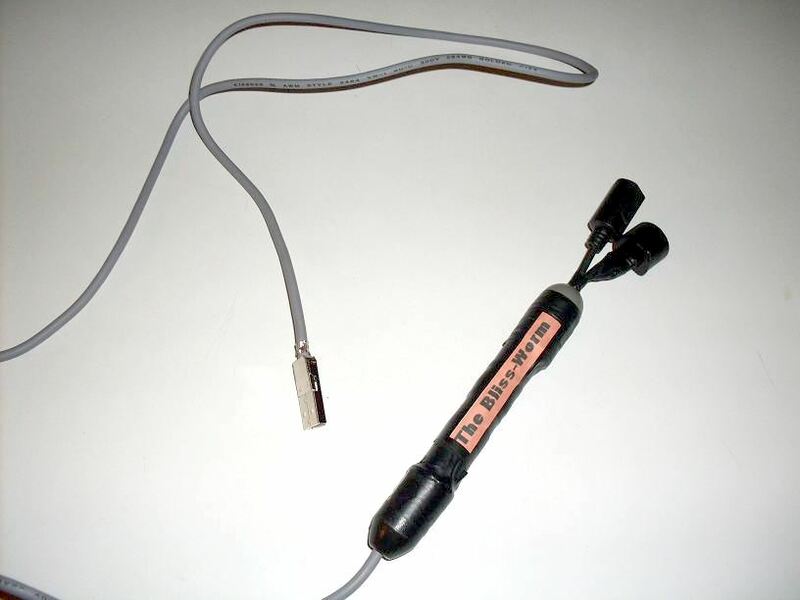 The sampling cannot be done exactly at 2μS. There is some jitter introduced by the polling loop used to detect the falling edge. In other words, some samples will be taken even closer to the rising edge, or during the rising edge. The Hori-mini PAD internal oscillator frequency may vary between units and with temperature. In other words, some controllers may send bits at a slightly slower rate (does not help) or faster (helps). The relatively slow-rising of the data line may also hinder reliability. At what point exactly will the MCU see a logic 1? This is in the MCU specs, but it may change slighly from unit to unit or with newer version of the chip (e.g. 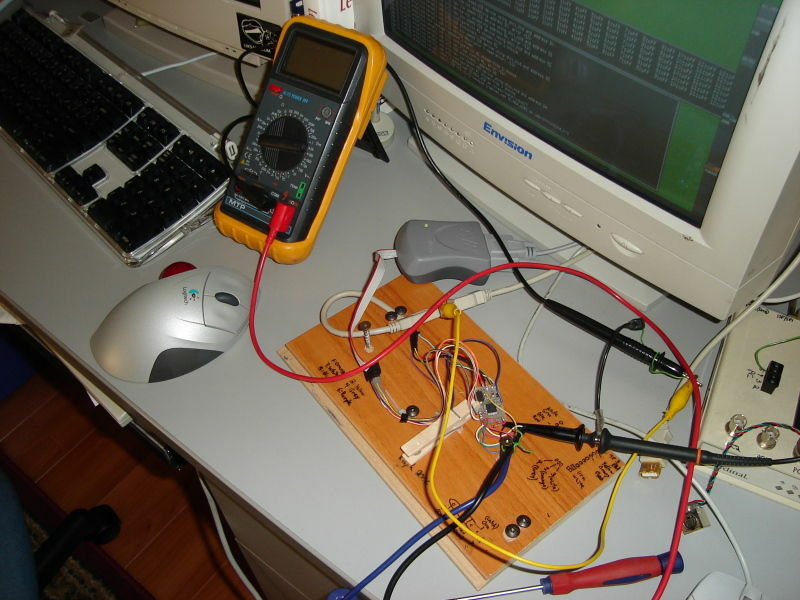 Atmega8a) And if an extension cable increases capacitance, the situation will be worst. Compare time spent low vs. high, if more time was spent low, we got a 0. Otherwise, we got a 1. Counting is done in assembler to be fast and predicatable (i.e. no C compiler optimisations in the way). At 16mhz, each polling cycle takes around 312.5nS. This means a 1μS level will count as 3 cycles and a 3μS will count as 9 cycles. If the timing is slower, the number of cycles will be greater, but the time spent low vs. time spent high relation will still apply. Since release 1.4, controller polling is synchronized with USB polls. The helps maintain accurate timing during communication with the controllers. 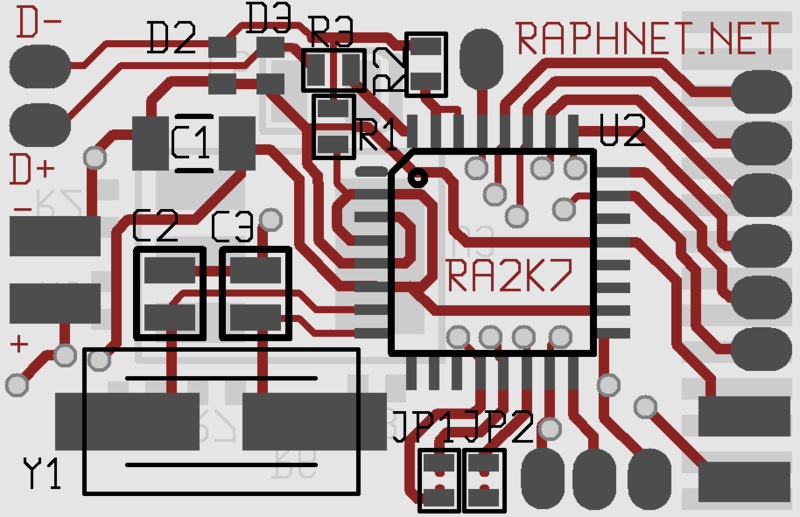 It is hoped this will increase the (already quite good) compatibility and reliability of the circuit. Technocal explaination follows. Remember the USB implementation is all software. 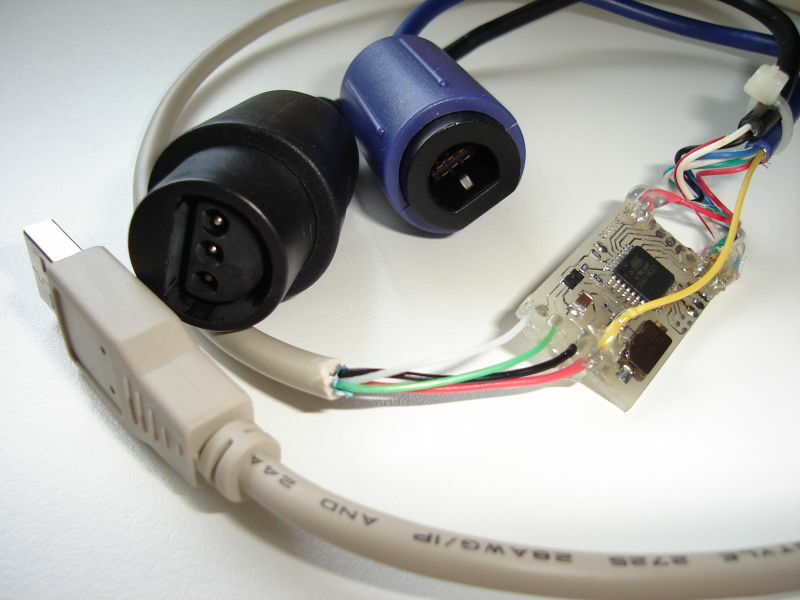 The MCU can therefore be interrupted at any moment to take care of USB communications. Occasionally, this happens right when we are in the middle of communication with the game controller, messing with the timing. This is demonstrated on the picture on the right. 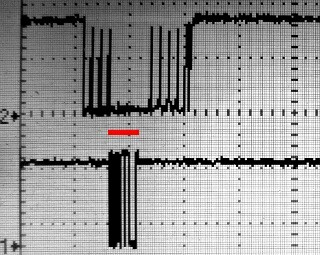 Red marks a pause in the transmission (top waveform) because of USB communication (bottom waveform). 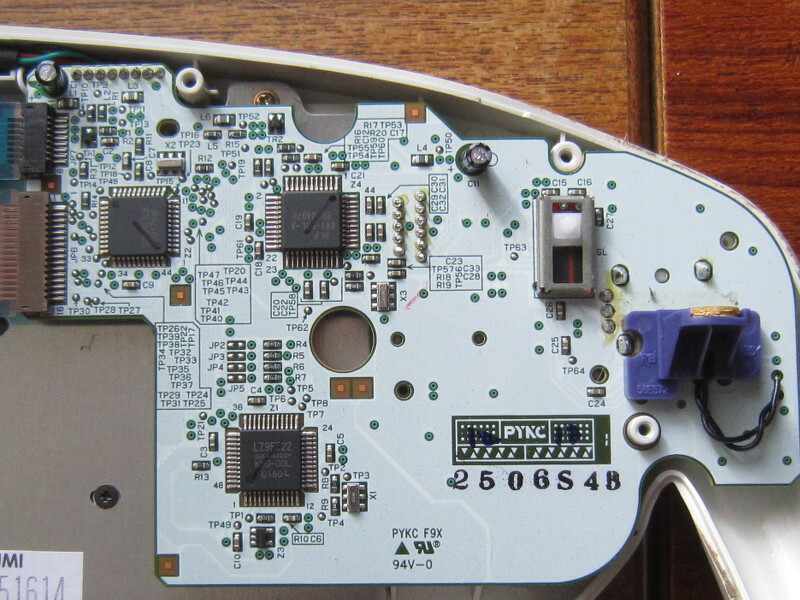 When an USB interrupt occurs at the wrong moment, the gamecube/n64 protocol frame is potentially corrupted and if it is, it should be discarded. 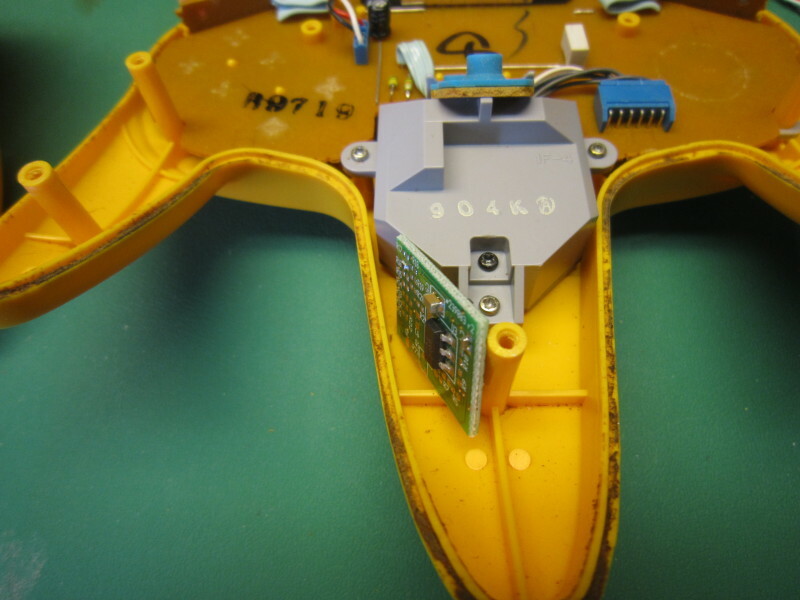 When trasmitting, we rely on the game controller to detect the error and drop the frame. Then we simply timeout waiting for the answer. If instead the interrupt occrurs during reception, we will miss some transitions and won't receive the number of bits we expected. Despite of the above theory, it would seem that occasionally (once in several minutes) some errors are not detected. A few users had reported that from time to time buttons seem to be reported active for a brief moment (even though hey were not pressed) so I decided to eliminate this risk by preventing these interrupts from occuring at the wrong time. And indeed, with the new white Gamecube controllers, the only controller I could confirm the problem with, the problem appears to be gone. Disabling interrupts during the timing sensitive communication is not possible due to the software USB implementation that does not allow us to disable them for long enough a time to be useful. On the other hand, we have approximately 900μS between interrupts which leaves us enough of time to communicate with the controller without being disturbed. We just need to synchronize with the USB interrupts and poll the controller when USB is idle. I thought of a very simple software solution. The logic which controls the controller polling rate stays the same. But just before the actual communication, the MCU is put in a sleep mode (IDLE mode). In this mode, normal execution stops until an interrupt occurs. When the execution resumes, we know an interrupt has occured and has been serviced so we can just continue and poll the controller. A small delay before polling helps us for cases where we receive a few interrupts in a burst. 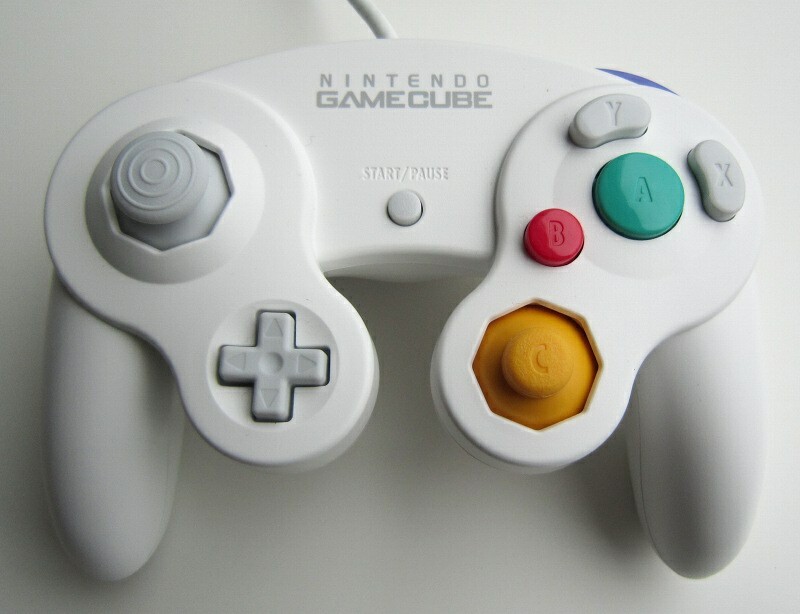 The Gamecube controller sliders are often problematic because they lack a central resting position. Many games assume an axis to be active when the value it reads is different, within a certain margin, from the center position. Thus, when performing button assignments, the L and R sliders will often immediately register as active and hinder (or most likely, prevent) successfully configuring the game for the controller. The following tool must be run after performing calibration (standard windows tools) . 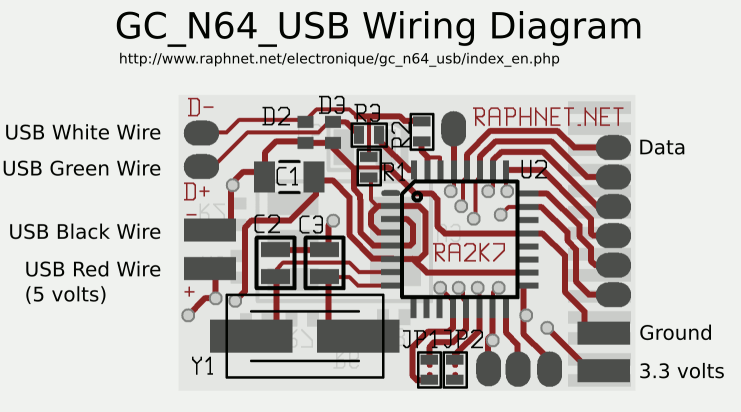 When it is run, it looks for raphnet GC/N64 to usb adapters and alters the calibration data the system keeps for each unit found. All axis are left as calibrated, except the L and R sliders which are recentered. gc_calfix_ng_v1.3.zip Supports all firmware versions. gc_calfix_ng_v1.2.zip Supports up to firmware version 2.3. Since firmware version 2.9, the Gamecube keyboard is supported and can be used under Windows and Linux. 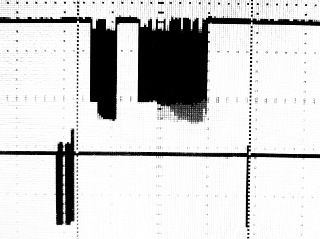 Note that I only tested ASCII model ASC-1901P0. This keyboard has a dual-connector cable. The gray connector is for the keyboard function and the purple one for the Joystick function. 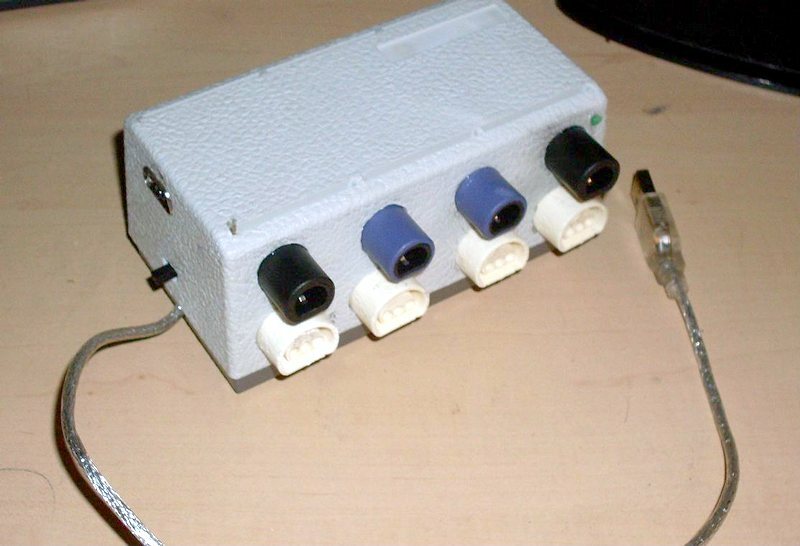 To use both functionalities simultaneously with a PC, two adapters are required. Note: Only the first 16 bits are used for ID. So the keyboard ID is in fact 0x0820. Shortly after, I looked at a good gamecube documentation and confirmed I was getting the correct ID code, everything fine. I then continued experimenting and tried polling the keyboard using the command normally used to read the state of a controller (0x400300) but the keyboard did not answer. Not the right command. Back to the documentation, I learned comand 0x540000 should be used. Then of course, it worked. 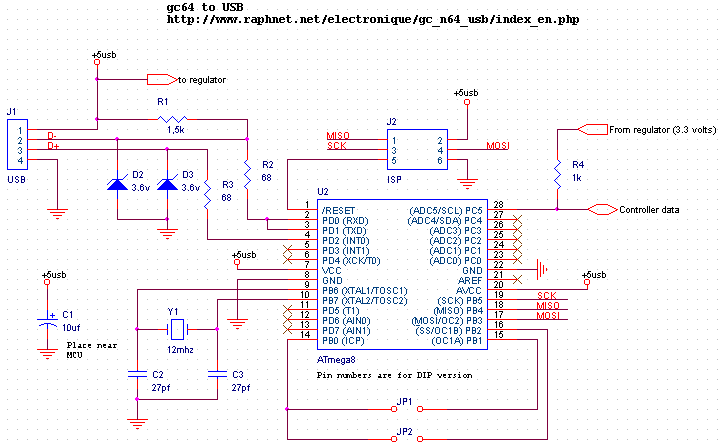 Bits 27-24: Looks like a 4-bit counter. Purpose unknown. 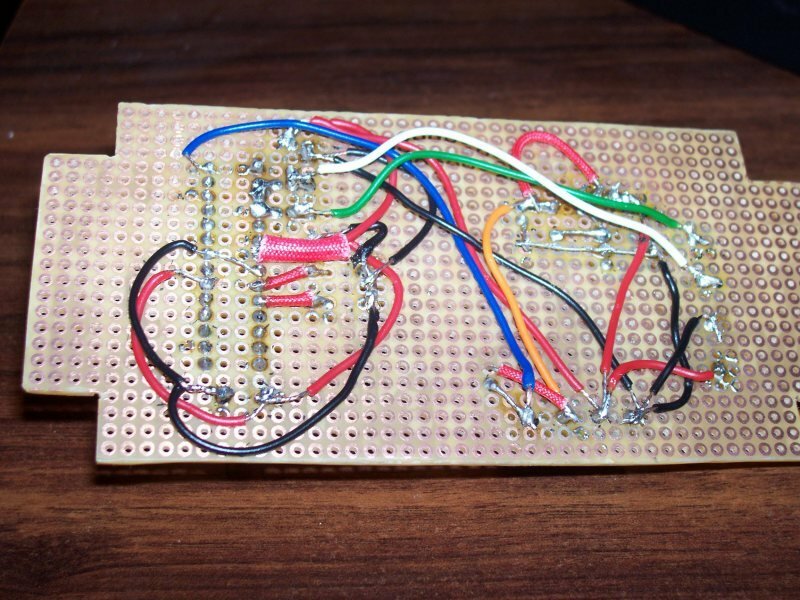 Bits 6-4: Maybe a checksum. Depends on the depressed button combinations. Bits 3-0: Looks like a 4-bit counter. Purpose unknown. This keyboard suports up to 3 simultaneous keypresses so I built the HID report descriptor accordingly. Usually, "special" keys such as CTRL, SHIFT and ALT are transmitted using dedicated bits in the report, but since the Gamecube keyboard does not have this concept and simply reports those keys like others (using full 8-bit keycodes), I do the same. So I created a translation table. 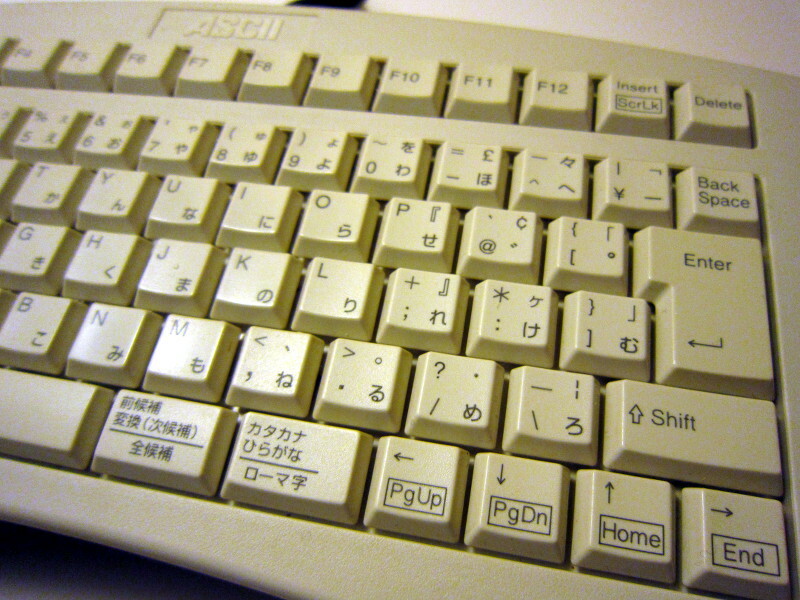 As this is a Japanese style keyboard, there are a few unusual keys and many won't produce the labelled characters unless the PC is configured to use a Japanese Keyboard. 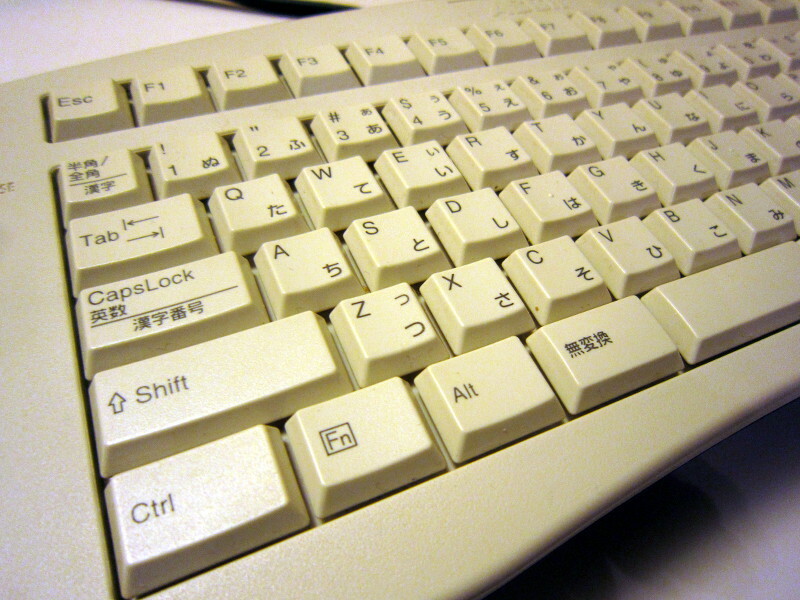 ¥| 0x36 International 3 0x89 Extra key before "back-space"
ALT (left) 0x57 Right alt 0xE6 Actually a LEFT-ALT key on the keyboard, but RIGHT-ALT is required to access alternate key functions 漢字、漢字番号、全候補 and ローマ字. 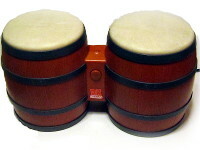 The DK Bongos act like a standard controller so the adapter supports them without complications. Microphone R, varies with sound intensity.